An exterior view of the Yad Vashem Holocaust memorial museum in Jerusalem. 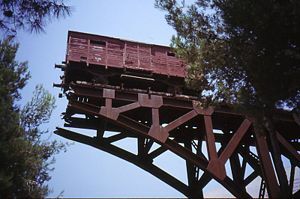 Yad Vashem (Holocaust Martyrs' and Heroes' Remembrance Authority) is Israel's official memorial to the victims of the Holocaust, established in 1953, through the Memorial Law passed by the Knesset, Israel's parliament. that will not be cut off." In Hebrew, "a memorial and a name" translates as "yad va-shem." Located in Jerusalem, the complex consists of a number of memorials: Hall of Remembrance, Righteous Among the Nations Walkway, Garden of the Righteous, Children's Memorial, Valley of the Communities, Memorial to the Deportees, and the Hall of Names. The main museum is the largest devoted to the Holocaust in the world, with extensive archives. The purpose of Yad Vashem is to memorialize the victims as well as to educate future generations. It is believed that knowing what happened will prevent its occurrence ever again. The creators have succeeded in making the Holocaust personal, without demonizing the perpetrators. Instead, the focus is to honor those who suffered through those days and recognize the horrendous conditions of their lives and deaths. 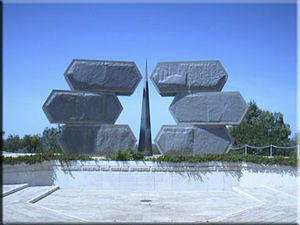 Memorial Monument to the Jewish Partizans in the Shape of a Star of David, Yad Vashem, Jerusalem. 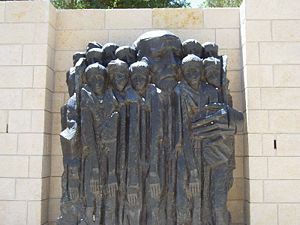 Janusz Korczak and the Ghetto's Children, sculpture by Boris Saktsier (1978), Yad Vashem Memorial, Israel. Memorial to Deportees, Yad Vashem. Originally proposed by the 1945 London Zionist Congress, Israel's national Authority for the Remembrance of the Martyrs and Heroes of the Holocaust, Yad Vashem, was established in 1953, by an act of the Knesset. Its purpose is to commemorate the six million Jews—men, women, and children—who perished in the Holocaust. Also commemorated are the heroism and fortitude of those who fought in the Ghetto revolts. The non-Jews who risked their lives for their Jewish brethren are remembered as the "Righteous Among the Nations." A living memorial, Yad Vashem serves to perpetuate the legacy of the Holocaust to future generations. A plaque at the memorial is inscribed, "If we wish to live and to bequeath life to our offspring, if we believe that we are to pave the way to our future, then we must first of all not forget." 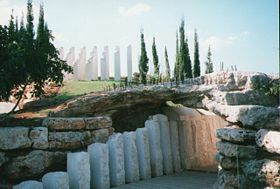 The Hill of Remembrance (Hebrew: Har Hazikaron), a hill on the outskirts of Jerusalem, is the location of the memorial site, which houses an historical museum of the Holocaust, facilities for conferences and memorial gatherings, and a research institute. There are a number of commemorative monuments, a central archive, and a research center for the documentation of the Holocaust. Each year on the anniversary (according to the Hebrew Calendar, on the 27th day of Nisan) of the beginning of the 1943 Warsaw Ghetto Revolt, state ceremonies are held. This day is officially recognized as Remembrance Day for the Martyrs and Heroes of the Holocaust. Yad Vashem is also a feature of foreign dignitaries' official visits to Israel, often one of their first stops in the country. Inside the haunting children's memorial building at Yad Vashem. On March 15, 2005, the inauguration of the a new Holocaust History Museum took place, with leaders from 40 nations and the Secretary General of the U.N., Kofi Annan, in attendance. More than a decade in the making, the new museum is the largest Holocaust museum in the world. It is carved into the mountain and designed to reflect the story of the European Jewish community during the Holocaust and their resurrection from the ashes in Israel. The impressive building was designed by the worldwide renowned Jewish architect, Moshe Safdie. Funding for the project came from private donors through the American Society of Yad Vashem and other Yad Vashem Societies in Israel and around the world, as well as from the Conference on Jewish Material Claims Against Germany, and the Government of Israel. The new facility, built to replace the original which was constructed in the 1960s, is four times the original's size. A prism-like structure, the building's triangular architectural-shape is said to represent the bottom half of a Star of David, representing half the world's Jewish population which perished in the Holocaust. Entrance marker at the Garden of the Righteous, Yad Vashem. Yad Vashem Hall of Names. Image by David Shankbone, 2007. The building's 180 meter long corridor in the form of a spike is lined with stark walls made from reinforced concrete. From this corridor emerges ten exhibition halls, each dedicated to a different chapter of the Holocaust. The museum combines the personal stories of Holocaust victims and survivors and presents in its exhibitions about 2,500 personal items: Artworks and letters from the Holocaust by survivors, museums, and memorial sites around the world. The uppermost edge of the building cuts through a mountain, with a skylight protruding through the mountain ridge. The exit emerges dramatically out of the mountainside, affording a view of the valley below. 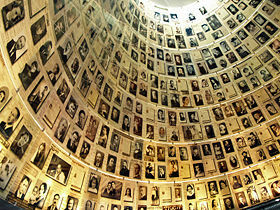 Hall of Remembrance: This is the principal memorial at Yad Vashem. Ohel Yizkor in Hebrew, this is a harsh concrete-walled structure. Empty except for an eternal flame at the center, the black basalt floor is engraved with the names of 21 Nazi extermination camps, concentration camps, and killing sites in central and eastern Europe. A crypt in front of the memorial flame contains ashes of victims. Righteous Among the Nations: The path to the Hall of Remembrance is lined with trees that were planted to honor non-Jewish men and women who risked their lives attempting to protect Jews from the horrors of the Holocaust. Several of the trees honor members of the Christian clergy, among them a Franciscan priest from Assisi, the bishop of the Greek island of Zakinthos, a Polish nun from Lithuania. and a French Protestant pastor. 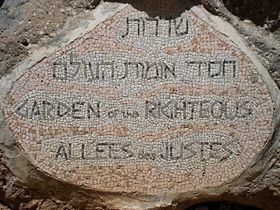 Garden of the Righteous: The Garden of the Righteous is an additional means of honoring those who have been given this honor (nearly 22,000 persons by mid-2007). A person who has been bestowed with this honor is awarded a medal bearing his name, a certificate of honor, and his name is added to those on the Wall of Honor in this memorial section. Children's Memorial: Perhaps the most haunting of all memorials on site, this building memorializes the 1.5 million Jewish children who perished in the Holocaust. This is an underground cavern in which the flickering flames of memorial candles are reflected in an infinity of tiny lights within the prevailing darkness. As one finds their way around the circular path, he views photos of the children as a recording plays, simply stating the children's names and countries of residence. Valley of the Communities: Here massive stone walls are engraved with the names of over five thousand Jewish communities that were destroyed and of the few that suffered but survived in the shadow of the Holocaust. This is a 2.5 acre monument. Memorial to the Deportees: Thousands of Jews were transported to death camps in cattle cars. This memorial is one of the original cattle cars used for that purpose. It is perched on the edge of an abyss, facing the Jerusalem forest. 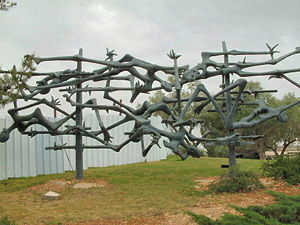 It is meant to symbolize both the impending horror, and the rebirth which followed the Holocaust. Hall of Names: This is a repository at the end of the museum's historical narrative, with "Pages of Testimony" acting as symbolic gravestones. Names and biographical data of millions of Holocaust victims are recorded. This tribute personalizes the victims beyond a mere name list. 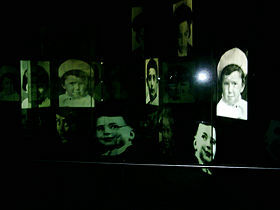 There is a separate room where visitors can search a central computerized database of Shoah (Holocaust) victim's names. Nearly 55 million pages of documents, nearly 100,000 photographs, film footage, and the videotaped testimonies of survivors are collected in the Yad Vashem Archive. It is the largest and most comprehensive repository on the Holocaust in the world. The library contains more than 80,000 titles, thousands of periodicals, and a large number of rare documents. The impact of a visit to Yad Vashem is due in large part to the personalization of the museum as well as each individual memorial. It is meant to share the legacy of the Shoah. Told from the point of view of the victims, they are the focus. The museum is highly personalized, there is no portrayal as "anonymous objects." Within the museum are hundreds of pictures, Yellow Star of David patches that Jews were forced to wear, camp uniforms, and clothes taken from the gas chambers. One will also find the braids of a little girl cut off by her mother before her death in Auschwitz, final letters of the victims, and the remains of containers which once held human ash. The curator of the museum, Avner Shalev, explained, "It is impossible to understand the Holocaust and absorb its meaning without learning about those who were most directly affected—the Jews." Items in the museum are not only from the Holocaust itself, but begin prior to that time, especially detailing the rise of Nazism in 1933, and continue to the establishment of the Jewish state in 1948. A spokesperson and organizer of the new museum said, "We gave the victims an identity. We gave them a voice. We gave them a face. We did the same thing to the Nazis … For each one we showed who they were. That they were not monsters but people who did monstrous things." ↑ Yad Vashem The Holocaust Martyrs' and Heroes' Remembrance Authority, The Hall of Names, Retrieved August 24, 2007. ↑ Yad Vashem The Holocaust Martyrs' and Heroes' Remembrance Authority, The International School for Holocaust Studies. Retrieved August 24, 2007. ↑ Joel Leyden, Israel Says Never Again With New Holocaust Museum. Israel News Agency. Retrieved August 24, 2007. American Israeli Cooperative Enterprise—Jewish Virtual Library. Yad Vashem. Retrieved August 24, 2007. Leyden, Joel. March 13, 2005. Israel Says Never Again With New Holocaust Museum. Israel News Agency. Retrieved August 24, 2007. Lichtenstein, Aaron. 1981. The Seven Laws of Noah. New York: Rabbi Jacob Joseph School Press. All links retrieved January 31, 2014. Hightech Marketing-Service. Károly Szabó - his role among Wallenberg’s supporters 1944-45. This page was last modified on 31 January 2014, at 15:34.